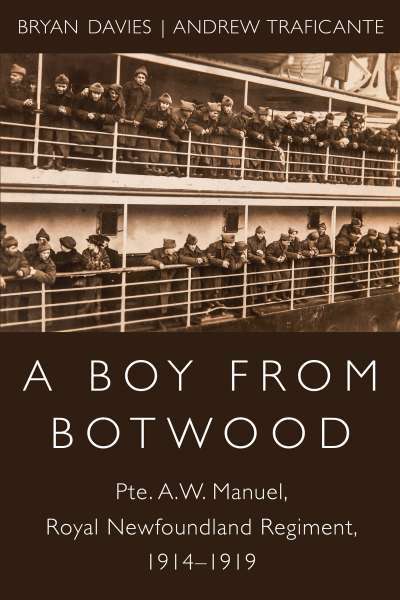 Recently I had a chance to read an advance copy of A Boy from Botwood, which I just finished. The book is due out in January 2017. I’m going to tell my story. With those words, eighty-three-year-old Arthur Manuel set his remarkable First World War memoir in motion. Like many Great War veterans, Manuel had never discussed his wartime life with anyone. Hidden in the Manuel family records until its 2011 discovery by his grandson David Manuel, Arthur’s story is now brought to new life. Determined to escape his impoverished rural Newfoundland existence, he enlisted with the Royal Newfoundland Regiment in late 1914. His harrowing accounts of life under fire span the Allies’ ill-fated 1915 Gallipoli campaign, the Regiment’s 1916 near-destruction at Beaumont-Hamel, and his 1917 Passchendaele battlefield capture. 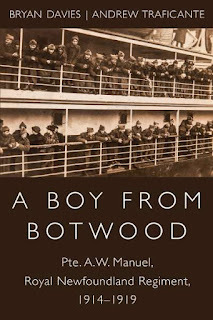 Manuel’s account of his seventeen-month POW experience, including his nearly successful escape from a German forced labour camp, provides unique, compelling Great War insights. Powerful memories undimmed by age shine through Manuel’s lucid prose. His visceral hatred of war, and of the leaders on both sides who permitted such senseless carnage to continue, is ferocious yet tempered by Manuel’s powerful affection for common soldiers like himself, German and Allied alike. This poignant, angry, witty, and provocative account rings true like no other. Although there has never been a war that was fought nicely, the trench style of warfare fought in the first world war sounds utterly horrible. The years since has taught us how inept the generals were in their strategy to wage the war against the Germans. Their attitude that machine guns were just a fad in the war and to tell their troops to just walk across no man's land when attacking instead of charging across it shows they had no concept on how to lead. Much of that comes through in this book. Manuel constantly shows contempt for the ones in charge, sitting back safely in England, eating well and sipping brandy while their troops eat slop, fight off rats and lice, while suffering from a variety of diseases. Manuel gives us a first hand, up close look at what it was like to be a soldier on the British side and after taken captive, how German life in the trenches was far more comfortable for their soldiers. He lived through the hell of a slave labour camp and his account of his escape is an amazing dramatic read. My grandfather fought with the Royal Newfoundland Regiment during this war so much of what Manuel experienced, so did he. Incredible to know the hell that a family member had to go through. This book is an incredible eye witness account of the life of a World War One allied soldier and is well worth reading. I have just finished reading this incredible book. I was born and raised in Botwood and my grandfather was Norman Dean who "went over the top" at Beaumont Hamel, was severely wounded and died shortly thereafter. This wonderful offering offered an insight that the young men on both sides of the war endured. To all involved in this offering may I say thank you. To others who seek to understand what went on from someone who served on the front line this is a must read. Mom never met her dad. A few years before her passing a knock came on the door and she received a package containing all of his medals and various effects he carried into battle. It touched her deeply and she was forever changed thereafter. I believe the reader will be taken to a different place and too will be touch my the revelations of Arthur Manuel, A Boy From Botwood.